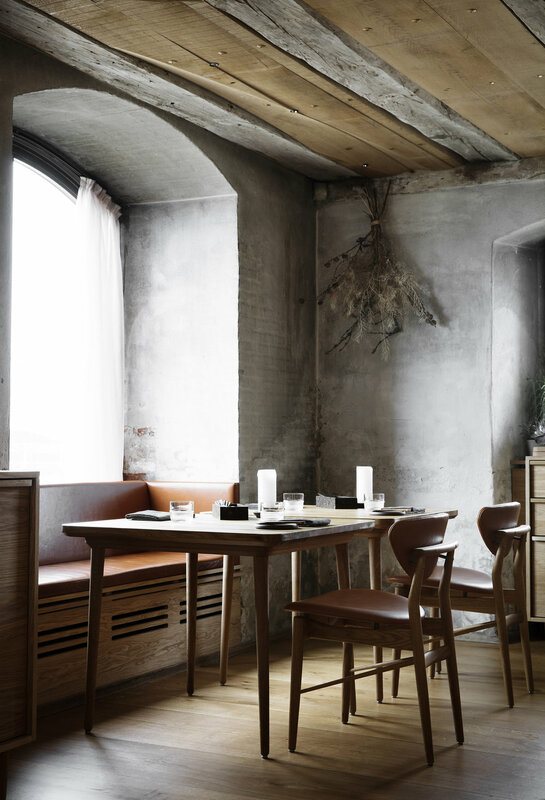 In collaboration with Norwegian design and architecture agency Snøhetta, Danish food scene stars, noma restaurant group, opened a new restaurant in June this year. The result sounds just as mouth-watering as it looks visually stimulating. Titled Barr (meaning “barley” in old Norse), the restaurant stretches—in contrary to the restaurant group's traditional focus on nordic food and aesthetics—its conceptual arms across the North sea, drawing from the drinking and eating traditions of the British Isles, Benelux and Scandinavia. This not only reflects in the restaurants experimental take on traditional dishes served with a wide selection of craft beer and aquavit, but also in the restaurant's interior and visual identity. Built on the concept and philosophy of “gestalt,” meaning an organized whole that transcends the smaller constituent parts from which it is built, Snøhetta looked to microscopic studies of foods and beer from the region, which influenced everything from the colour palette to the furniture — an approach that becomes evident in the restaurants’ interior; characterised by its use of raw material such as wood, leather and wool, contrasting with the rough texture of the original stone walls. Snøhetta also designed Barr’s branding and visual identity, focusing on a colour palette that references the natural seasons, honest and direct imagery, and a selection of paper qualities and embossing of patterns. In addition, Snøhetta designed a unique typeface called Barr Gräbenbach, which is inspired by the typographical heritage of the North Sea region. Barr is located inside the old home of noma on the Copenhagen city’s iconic waterfront, Nordatlantens Brygge.